My first visit to Escape Rooms had been such a success that I needed to go back to experience their other room as quickly as possible. In fact, I’d have chosen Pharaoh’s Chamber the first time round but the timings didn’t work out for us, so I was super excited to finally get to do it. I was realistic though – it seemed unlikely that they’d have two rooms quite so impressive. 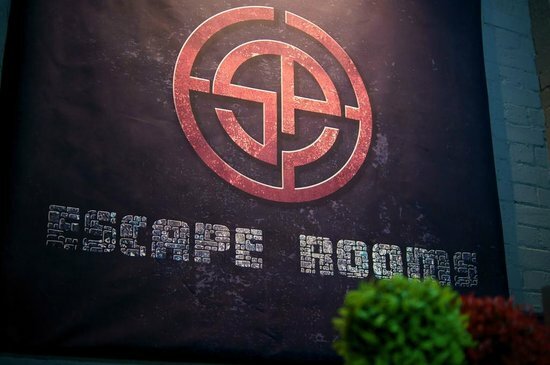 I’d had quite a bit of interest when I sent out my email, so I’d booked out both Escape Rooms’ rooms, which gave me a great opportunity to see how they handled two groups in parallel (answer: very well indeed) and meant there were three hosts in action. The excellent host we’d had from the previous visit was back, along with a couple of other people who came across as a little newer, maybe even trainees. They did the job well though, and generally put everyone at ease before we headed in. You’re a group of explorers who’ve descended deep into the heart of a Pyramid, reaching the Pharaoh’s Chamber. All who have come before you have mysteriously disappeared, and a curse has been laid on the room that means anyone staying longer than 60 minutes will perish. Your task it to light the flames of the Gods and escape before your time is up. Solidly themed room with lots of Egyptian ornamentation that makes you feel it’s more than just a collection of puzzles. In fact, chatting to the host on our previous visit, he’d described this room as more visual, and the other one as more puzzly. I don’t entirely buy that, but I can see where he was coming from. We worked our way through the puzzles reasonably well, although it was only about half way through that I realised what our goal really was. That was a shame, because they’d made it clear outside the room, but I hadn’t put two and two together. While I obviously was partially to blame in that, I think it would be worth them making it clear, as it adds to the sense of excitement. There was a good variety of fun puzzles, and it seemed each participant could wander off, solving puzzles and collecting various clues for others along the way. It did get a little linear as time went on, but that worked well, because by then we’d picked off most of the easy puzzles and were ready to team up a bit more. We got utterly stuck on one particular puzzle where we worked out the correct solution almost immediately, but thought that it was way too hard to be true, and then reverse engineered several different parts of it, to the point of almost cracking it without help. We failed though and had to ask for a clue. Kudos to the host though – he didn’t jump in, even though we’d been stumped by it for a while, which I think was the right call, because we were still making progress right up to the point we asked for help, and we had plenty of time left. Sadly, we didn’t get the record this time around, but we did get out with a healthy amount of time left (ten minutes or so). Our team mates had struggled with Room 33, so, while they escaped in time, they were nowhere near our record from the previous visit. A perfect result from my point of view! I told myself going into this room that I absolutely shouldn’t compare it with Room 33, that it could only lead to disappointment, but I couldn’t help myself. Don’t get me wrong – this was a great room with a number of good puzzles, but it’s no Room 33. I’d still highly recommend it though, but probably just outside the top tier of London escape rooms. If you think you’ll do both, then definitely do the Pharaoh’s Chamber first. Once again we ate at the George Inn, where we had another perfectly good meal, although this time upstairs in the restaurant since there were so many of us. Beware if you eat up there and want something on tap – we were told we couldn’t order any of the draft beers, but eventually worked out that they were happy for us to go downstairs to the bar ourselves and bring them up. Phew! Previous Post: Secret Studio: Escape in Time! Is it scary? My sister hates scary stuff and has a birthday party there she’s freking out in scared for her.